On the 6th of April 2012 Grace celebrated her 6th birthday with a trip to Legoland. Grace and her sister Alice had a full day on all the rides. It was a very special day indeed and Grace 's smiling face was prominent at every opportunity for a photo. She was in charge for the day and nobody was allowed move or ask questions as she took full control. The whole family were told when to eat and what to eat all day. Grace is in great form and continues to have as near normal life as possible. Most of her trips to the Doctor are for routine checks and they are all clear at present, (Thank God). She has no more planned trips to the US. Grace returned from New York and all of her tests show that she is doing fine. Nothing to worry about at all . Nothing showing up. The Doctors are so happy with her that they have decided that no further testing is required. No more trips to New York every three months. They have recommended that she has an MRI scan every six months or so and nothing else. It has been well over 4 years since it all started (October 2007) and the joy in seeing Grace prepare form her 6th birthday is something that could not have been imagined. Grace and her battle with cancer could only have been achieved with the tremendous help and support of all the friends and family who did so much. with a smile on her face she went to the hospital A and E department of the RUH in Bath. A very young junior doctor did, what I hope they all do, and started from scratch and was the first to discover what was wrong with Grace. 4 years ago Kevin and Millicent were thrown into a world of confussion and discovered along the way that great people to exist in the world. It is not possible to every thank enough all of the people who stepped forward to help, thank you. It has been a long and sometimes dark road over the last 4 years but thankfully Grace is very much still here to tell the tale. Thank you to everyone who helped , prayed and thought about her in her fight, every kind word and deed was needed and appreciated. 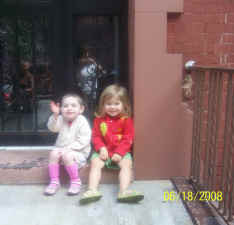 Grace was back in NY for her tests again in July 2011 and all her scans are clear. It was as always a tough week of scans and early mornings in the hospital but with the help of her sister she flew through it. Grace had 3 MRI scans and an MIBG scan followed by bone marrow. Grace will go back again in October to repeat the scans just to keep a very close eye on her progress. 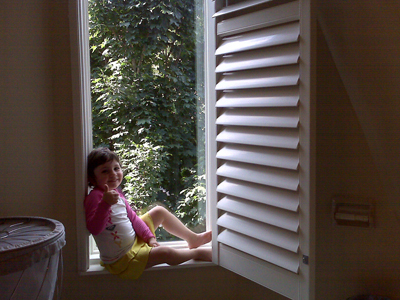 Grace is now four months away from being 4years since she was first treated for Neuroblastoma, early October 2007. Grace repeated all her tests at the end of April and we are glad to say all is well. She is due back in MSKCC again near the end of July to repeat the process. The hospital and doctors are very pleased with her and are transferring her to the long term follow-up program. We hope this will mean less testing and less trips to the US. Grace was back in NY again at the end of January and after a full week of tests she is still all clear. It is planned that she will continue with regular check-ups every three months but they may reduce the amount of tests they normally do. This might make the trips to NY a little easier on Grace. Grace is going to be 5 years old on the 6th of April and will then return to NY again at the end of April for more tests. Grace was back in NY for her tests at the end of October 2010 and we are delighted to say that she continues to be all clear. There wass omething small on her liver but it turned out to be nothing to worry about. All she is now thinking about is her play at Christmas in Kingswood. Grace will be back in NY again in January to repeat her tests.........as standard. It was three years on the 12th of October 2010 since Grace was first found to have cancer and the great news is she seems perfectly normal. The tests and re-tests continue and she is having her staging done again on the 20th of October. Fingers crossed for another " all clear" from NY. Grace also has had her first school report and she is doing great, it seems that every teacher and student has met Grace as she makes herself at home in her new school. She has benefited greatly from her time at Children's Garden Nursery in Toronto. Three years is a big moment for Kevin and Millicent and a time to look back over all the obstacles that have been overcome in getting Grace to this stage. Long may she stay NED and move on with her life ....she has been through enough. Grace is due to go back to NY in October for a full check-up as standard. She continues to develop normally and is now two full years post relapse in the brain area. Life moves on as normal as possible. Grace repeated all her tests in NY at the end of June; MRI , MIBG and Bone Marrow. All the tests came back completely clear. It is planned to stage her again in October 2010. It is very important with Neuroblastoma to stay on top of her staging and to do them as often as possible, every three months in NY, is the plan. Following her tests in NY Grace travelled on to Bath, Grace and the family are all now back together in Bath, it has been a long hard journey since January 2008 when we headed for the US with our hope of returning with a healthy child. Grace is cancer free since September 2008 and is showing no signs of having suffered at all from her ordeal. As we have now returned to the UK it is worth reflecting on the treatment that we received in Sloan Kettering in NY. The treatment worked for us and for that we will always be grateful. The news from there is that they have 7 kids on the new vaccine and so far all doing well, fingers crossed this might be the cure that we are all looking for. They continue with the antibody treatment, now in their 12th year. They are way ahead of the treatment available in the UK, we were lucky to be able to go . Her school in Canada gave Millicent and Kevin a detailed report of her progress for the year and she is doing great. 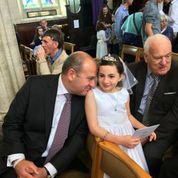 Grace is due to start school in September in Bath and with this in mind she is going to spend next week attending the school. It is with a lot of pride that we, her parents, are planning on walking her to school .. first day at school moment for her. As we take her to school we have nothing to tell the teachers about her .....she is as normal as any child going to school. Grace has now finished the Temozolmide and the Accutane. It has been along ten months and the constant taking of tablets has now almost come to an end. Grace was doing 14 days of Accutane followed by 42 days of Temozolomide and then Accutane again for 14 days. A total of 210 days of Temozolomide (five cycles). She did not suffer much from it and her counts were mostly unaffected by the drugs. She would play games each day and pretend that she was doing magic tricks by making the tablets disappear, sometimes taking four at a time. Grace also had her 4th birthday on the 6th of April and she had a party a few days later with all her school friends. It was a great success as the weather was perfect. The party was a sports-ball party in the park. Fun and games for all with lots of running around and jumping. Grace will continue to be staged ever three months with the next set of tests arranged for the end of June. The whole family will be travelling back home to Bath after these tests. Both Alice and Grace are looking forward to the move back and the idea of going back to school again in England. Grace repeated all her tests in NY on the 11th/12th and 13th of March 2010, it was a tough schedule but as usual she flew through the tests with little fuss. The good news is that all her results are perfectly clear and she is doing very well. She is still on drugs(chemo) for another two months or so and then she is finished her treatment. After her tests she travelled to England and got to meet the teachers and children in Kingswood school where it is planned she will start full-time school in September 2010. Grace is also approaching her 4th birthday on the 6th of April 2010. This is great news for the whole family as she continues to do well and grow like a normal child. Grace had a great Christmas in Bath, Wexford and Cork. After her access port was removed in November she recovered quickly from the operation and was very much ready to travel home for Christmas. She was very concerned about Santa and would he know that she was not in Canada but in Wexford. We are delighted to say that he worked it out and arrived on time. Grace was able to meet many of her cousins for the first time and also meet many people that had not seen her in over two years. It was great for her and she quickly settled in and made herself at home. She is still on some chemo by tablet until March 2010 when she will be totally finished her treatment. She is schedule to have all her tests repeated , as standard, again in February. We hope and pray for a clean bill of health. Grace has now been clear since her operation in September 2008 and as we head into 2010 she does not show any signs of adverse side effect from the treatment. She continues to enjoy school where she is doing well, she also is doing music, ballet and swimming. She is due to start skiing this Sunday but we will see how it goes. It is planned that the whole family will return to life in the UK after Grace is finished her drugs, spring/summer 2010. Grace repeated all her tests last week and they are once again all clear. This is just fantastic news as they are also now taking out the access port in her chest on Tuesday 24th November. She is over a year clear since her relapse in the brain area and seems to be well over it. Because the port in her chest is being removed Kevin and Millicent are much more relaxed about flying long distance with her. It is planned to bring her back for a visit at Christmas to England and Ireland. She will visit her doctors in Bristol before spending Christmas in Ireland. It will be over two years since most people saw her and exactly two years since she went to the States. WE are delighted as you may guess that she is still completely clear, and looks great. no reason to think that she will not remain completely clear. Grace repeated all her MRI scans and MIBG test last week and we are delighted to report that they are completely negative. This was a great relief to both Kevin and Millicent as her previous tests (MIBG) showed a ''pin point '' up-take near her right eye. After getting the all clear Grace is back in school again, five mornings a week. She has also been cleared to get the vaccine that is under trial at MSKCC at the moment. She will do this after she finishes her current round of chemo drugs. She has started to skate as well as doing ballet and swimming. It is almost two years since Grace first showed any signs of cancer. She has made a great recovery and continues to make progress on all fronts. Kevin, Millicent , Alice and Grace would like to thank everyone who helped, prayed and supported them over the last two years, it has been some journey but one which they are glad to have had the opportunity to make. Grace had a great summer. She had repeat testing last week. 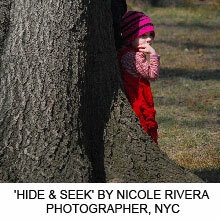 Her MIBG scan showed a tiny area of abnormality but this did not appear on her other tests. The doctors will repeat all the tests in a few weeks time to evaluate this further. She is on temodar a chemotherapy tablet which she takes for 6 weeks at a time with a two week break. During the 2 week break she takes accutane. She will repeat this cycle 6 times. Assuming she is okay she will go back to preschool next week. Grace continues to do very well. She is due to have all her tests repeated at the end of August as standard. These are repeated every three months and since the brain relapse in late August 2008 she has remained cancer free. This is truly a small miracle as most places offer little or no treatment for a brain relapse with Neuroblastoma. Kevin and Millicent think back to late August 2008 and just do not know how they found the tumour as early as they did, 'somebody is watching over us'. Grace is at cooking camp this week and she continues to make everybody smile with her positive attitude. She is eating more then she is cooking. Fingers crossed for her tests in two weeks. Grace is doing very well. Tonight we learned that her recent staging tests were negative indicating that she remains disease free. She is also now HAMA negative and will be able to have her third dose of 3F8 antibody next week. 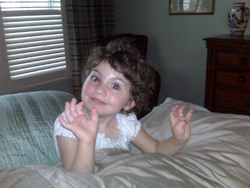 Grace had 5 courses of antibody prior to her relapse in the brain last September 2008. 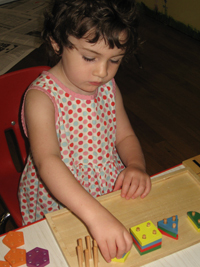 Grace attends a little preschool now on the days and weeks when she is not receiving treament or undergoing tests. Grace continues to pray for all the little children with cancer. Tonight, shortly after we got good news about Grace we heard some very sad news about an incredibly special little boy and his family, Jack Brown, who recently lost his battle with neuroblastoma. Grace was lucky enough to meet Jack last year in New York and he gave her a Sesame street toy which she still has and cherishes. Our thoughts and prayers go out to Jack's family who reached out to us when Grace was diagnosed. He was a truly special boy and they are a very special family. Kevin and I are numbed by this news and are now even more determined to pursue our goals through our Foundation, Angels for Hope Neuroblastoma Research Foundation Inc of raising sufficient funds for the vaccine against neuroblastoma relapes to keep these children well. We know that little Jack Brown, himself an angel for hope to all those whose lives he touched, will play an important role in inspiring groups to come together to cure this terrible disease. May Jack rest in peace. Amen. Grace has finished another course of 3F8 and did very well. It was just as painful as before but she soldiered on. She has now developed HAMA to the 3F8 so will not receive anymore for a while. She continues with maintenance chemotherapy for the coming year. The good news is that all her recent tests revealed no evidence of cancer. Her parents are now focussing all their efforts on the Foundation they have established in the USA called Angels for Hope Neuroblastoma Research Foundation Inc to raise sufficient funds to facilitate the development of the vaccine against relapses. The vaccine is being developed by Grace's doctors at MSKCC. This is Grace's best chance for long term survival and so too thousands of other children. The launch benefit for Angels for Hope will be held in New York City at The Carlyle Hotel on April 2nd 2009. Anyone who feels like making a donation to the Angels for Hope for the vaccine can do so on line using the following link. (Please note Grace is not a beneficiary of this charity that her parents have set up in the USA to facilitate research into new therapies including the vaccine for neuroblastoma). Grace is now just finished her CNS protocol for the brain relapse. She completed her second cycle of 8H9 recently. It was just as bad as the first cycle but she bounced back quickly. She is due to have staging tests next week to evaluate her overall response to the treatment. Meantime, she started school this week, yes school at age 2! The doctors advised her parents that due to the potential long term effects of brain radiation she needs to get learning as much as possible now. She loved being amongst children of her own age and wants to go everyday! She is learning French, drama and how to read! She will start back on 3F8 each month also. This drug was very painful when given before but her parents realise the necessity of giving her this treatment to try and prevent further relapses. Alice is helping her parents prepare for the next mission which is the launch of the new charity, Angels for Hope Inc in New York city on April 2nd 2009 at The Carlyle Hotel. 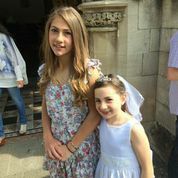 Both Alice and Grace have been inspirational for this effort to raise funds for a vaccine that can be given to thousands of children to prevent relapse of their disease. Grace completed her first course of the 8H9 treatment the week before the Christmas Holidays. The second dose that she received was radiolabelled and had a lot of side effects including nausea, vomiting and headaches. It was very hard on her parents to witness, as they had to sit behind a screen and were not allowed to touch Grace for 2 days due to high levels of radiation. Grace was very distressed by the treatment and the fact that she was in isolation. However once the radiation levels reduced she bounced back. She had a joyous Christmas and New Year with her family. She returned to Sloan Kettering tonight for the start of the second dose of the intra brain 8H9 treatment. Grace tolerated the new 8H9 treatment into her brain very well last week. She is having the second and much higher dose this coming week. She is enjoyed decorating her Christmas tree and taking a bath this weekend after a long week of extensive tests, MRIs and new therapies every day. Alice continues to be a very supportive and loving big sister which helps to keep Grace's spirits up. All of Grace's tests last week were clear of neuroblastoma. This was an amazing surprise for her family who are absolutely thrilled. It is a testament to the excellent care she has received to date and is nothing short of a miracle from God. This week Grace is due to commence the intra brain 8H9 therapy. This immune therapy will be given over the next 3 weeks. It is aimed at preventing relapses in the future. There are no guarantees but Kevin and Millicent are hopeful that at last Grace can start to live the life of a normal 2 year old. Her good humour and endurance throughout all of this is an inspiration to her family and all who know her. She has directly inspired her parents to take an active role in helping to minimize the suffering of other children with neuroblastoma. To this end it is pertinent to mention that, MSK are currently developing a vaccine to give neuroblastoma patients like Grace to ensure these children do not continue to suffer by relapsing. To help expedite this process, Millicent and Kevin with a team of friends are organising a benefit in New York on April 2nd 2009. The proceeds will go to the Angels for Hope; End Neuroblastoma Research Foundation set up recently by Grace's parents. This is a new Charitable Foundation that will be supporting novel therapies like the vaccine that are aimed at prolonging life and reducing suffering for neuroblastoma children all over the world. The positive energy that surrounded Kevin and Millicent from the outset of this dark journey provided by the extraordinary goodwill from friends, family, colleagues and strangers all over the world is the catalyst for the Angels for Hope Foundation. Grace is very tired this week after over a year of intense treatment. The last few months have been particularly demanding. However we are slowly getting news of good results. Her brain MRI scan and Jaw MRI scan were both negative this week which is very encouraging. Grace has a busy week ahead with bone marrow assessments, CAT Scans and MIBG nuclear scans to check out how she is doing in the rest of her body. She will have a general anaesthetic each day for these tests. She is in good form despite the exhaustion. If there is no evidence of disease elsewhere in her body she will be able to proceed to the intra brain 8H9 treatment next week. This will involve an inpatient stay for a test dose next week and the following week the therapeutic dose of 8H9. The team at Sloan Kettering have been wonderful. Dr. Kushner emails Millicent at all hours of the day as her test results come in to avoid even a minute of anxious waiting for results. This is truly a remarkable dedication to the cause. Grace has had a very busy time over the past few weeks. She endured 3 weeks of intensive brain and spine radiation, which required her to have a general anaesthetic each day during this time to facilitate the treatment. She had to fast every night, in preparation for the general anaesthetic the next day, until her radiation treatment was over the next day. Some days this meant fasting for most of the day. She never complained once about this. Kevin and Millicent fasted with her but they did complain a lot!! She tolerated the radiation well, but as expected on the last day all her hair fell out apart from her fringe. She has reassured us and her self that it will grow back again! She is not worried about this minor inconvenience. Her bone marrow was very depressed for 2 weeks after the radiation and thus she had to wait before proceeding with more chemotherapy. She was able to start the high dose chemotherapy this week which she had every day. She tolerated it well apart from being sick each morning after her breakfast. This week Grace also had an MRI scan of her brain and it was clear of tumor. Kevin and Millicent were overjoyed with this bit of good news, which is a very encouraging sign. During her chemotherapy today she insisted on going on the 'trick or treat' parade for Halloween, at Sloan Kettering with the other kids and collected a large bag of goodies dressed as a gorgeous pink poodle. Who could resist her?! The next step is to wait for her bone marrow to recover from this cycle of chemotherapy. There is a high probability it will not recover and she will need to be rescued with a stem cell transplant. Her risk of infection now is very high as her white cell count is very low which means she needs to be sheltered from any potential source of infection. She is enjoying dancing to her own song, Dance Grace Dance, composed by our great friend Dee Carstensen. We hope you enjoy it too! Grace has had a busy few weeks. She had a full week of radiation to her brain and spine last week, every day under general anaesthetic, followed by a rigorous routine of chemotherapy in the afternoon. She tolerated it all very well, never complaining and continues to smile her way through the day. This week she has continued her radiation therapy to the brain and spine each morning. She has been a little sick with diarrhoea and nausea. Her blood counts have dropped dramatically so now she must be kept in isolation. She cannot have any interaction with other kids, or go to crowded public places. This is hard for her as she gets older and also because she is a very sociable little girl. Her hair is starting to thin. She had become very proud of her little head of hair combing it every day and is a little put out about losing it all over again. However Kevin and Millicent have explained to her that it will grow back just as beautiful again. Next week she will again have radiation under General anaesthetic every day and then she will have a small break to allow her bone marrow recover in time for high dose chemotherapy. Grace is recovering very well after her operation. Her scar is neatly hidden behind a thick head of curly brown hair and no one would ever guess this little girl had had brain surgery less than a week ago. She had her first harp lesson today from Dee, our very good friend in New York,who with her husband Michael composed the most beautiful song for Grace. It brought a tear to her Mother's eye. Grace loves music. Grace will start her radiation tomorrow. Her brain and spine will be irradiated over a 3 week period. She will also need chemotherapy next week. After the radiation she will have a 2 week break then back to more high dose chemotherapy over 3 weeks and then followed by intra brain chemotherapy over 5 weeks. Grace and her parents have a long road ahead but they are very positive as are the Doctors at Sloan Kettering. Grace does not have any other involvement of her brain which is a good sign and the recent tests also did not reveal evidence of a relapse in other sites. Grace told Millicent today ' I finished cancer Mummy...... never again in my body'. There is a lot to be said for the power of positive thinking and Grace's parents are firm believers in this also! Lets all keep praying for Grace's full recovery and for all the other children with this terrible condition. Grace had neurosurgery on Friday 12th September at Cornell Hospital, New York. It was a long and very tense day for everyone, starting at 5.30am with an MRI. The surgeon told Kevin and Millicent after the MRI and before he began the operation that the lesion had grown significantly in the previous week and thus the surgery was going to be more challenging than expected. She was brought to theatre at 10.30am and Kevin and Millicent got hourly updates from the theatre staff. At 5pm Dr. Mark Souwedaine, the Neurosurgeon came to discuss the operation with them. He opened the discussion by saying 'I got it all', which was an immense and welcome relief for Grace's parents. However he then broke the bad news that the lesion looked very typical for CNS neuroblastoma. The implications for this is that Grace is going to need another 6 months of very intensive treatment at Sloan Kettering Hospital. On a positive note, her parents are thrilled that she has recovered so well from surgery as you can see from her picture taken less than 24 hours after the operation where she is still smiling! The other positive aspect is this lesion has now been removed with no evidence of any other lesions in her brain thus far. She is a brave little girl with a very happy temperament and when the doctors did rounds this morning she offered each of them a gummy bear sweet and said thank you! After they left she got up out of bed, helped get herself dressed and started running around the room! She never fails to amaze and delight all those around her by her courage and happy spirit. She is an inspiration to us all. This week will be very important for Grace in terms of planning for the next phase and for her parents who also need to do some planning to help Grace through this and at the same time keeping an eye out for her big sister Alice. Grace had her 5th cycle of 3F8 treatment in mid August. It was the hardest cycle to date. The pain was so intense that one day she bit her cheek so badly that she bled profusely and subsequently got an infection of her inner cheek that required several courses of intravenous antibiotics.On 28th August we learned that Grace had developed HAMA so this means that she will not receive any further 3F8 for a while- until the HAMA becomes negative again. On the same day that they learned this, Millicent and Kevin noted that Grace had a slight limp on running. She was otherwise in good form. This prompted a series of extensive tests at Memorial Sloan Kettering, including MIBG, MRI scan of brain and spine. 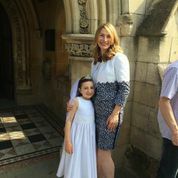 On the 1st September Millicent met with Grace's team at MSK and was informed that Grace had a 'lesion ' in her brain that would require urgent surgery. This lesion is felt to be a central nervous system manifestation of neuroblastoma; every parents worst fear for their child with this disease. Grace is scheduled for brain surgery at Cornell Hospital on 12TH September to remove this lesion. The week following surgery, more information will be available on the exact nature of this lesion and if it is benign or malignant. If it is neuroblastoma Grace and her family are in for a long hard road ahead but the team have been encouraging about the outcome with the intensive regime. Grace continues to have numerous tests in preparation for surgery including bone marrow aspiration and biopsy and lumbar puncture. As usual she never complains and is the picture of good health, thus it is easy to understand why her parents are in disbelief. We are delighted to report that Grace is doing very well now. Her last set of tests, at the end of June 08, show no evidence of active cancer. However the MRI scans of her jaw do show some remaining tumor but this is shrinking indicating continued response to her treatment. Her bone marrow is clear of neuroblastoma also. Grace has not developed HAMA as yet to the 3F8 which is really excellent news. She is due to have another course of 3F8 the week of the 11th August 2008 which will be her fifth dose. Grace is looking like a normal healthy 2 year old now sporting a brand new head of brown hair with blond streaks! Friends have joked that she has gone from a Sinead O'Connor look to that of Mia Farrow! She is also gaining weight and seems to have gained back her appetite. She has developed a very good sense of humour and is constantly cracking jokes and making funny faces which is a delight to see. Alice has been a huge support to Grace in her recovery and a great help to her Mum and Dad. Grace had a mediport inserted a few months ago which is a way of keeping her central line access but in a much easier to manage format. Because the mediport if hidden beneath the skin she can go swimming and have baths again. This is a welcome relief in the current heat of NYC! Kevin and Millicent hope that Grace will remain on 3F8 antibody therapy until Christmas at least but as always the testing for HAMA is done after each cycle and there is a chance that she will develop HAMA and have to come off the treatment. Kevin and Millicent are very encouraged that she has had five cycles of 3F8 to date. This is most likely due to the fact that she started the antibody therapy within 6 weeks of her surgery and after two cycles of high dose chemotherapy, as recommended by her doctors at MSK . Her next set of tests to check on her progress are scheduled for mid September. Grace did not develop HAMA and was thus able to have her fourth cycle of antibody last week. She found the week hard and was very ill with severe pain every day. Next week she is facing a battery of tests including, CT scan, MRI, bone marrow examination and MIBG scan all under general anaesthetic to find out if her treatment has worked to date. Millicent and Kevin will spend a tense week waiting to find out. However Grace is in good form now and is a real ' rogue'. She has started dance therapy at the integrative medical centre for Sloan Kettering Hospital as part of her Rehab. Today she went with her little friend Nini (pictured below with Grace) and they both had a ball. Next week she will attend the Foundation for Small Voices in between treatments to try her hand at some singing. She is constantly singing and dancing at home so Kevin and Millicent are trying to give her an outlet away from the hospital to foster a normal life after the past 9 months. Grace completed her third course of 3F8 antibody last week. 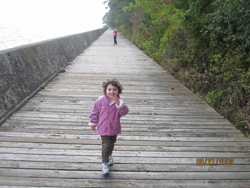 It was a tough week as she developed an asthma like illness, which the antibody treatment seemed to exacerbate. Several nights she had a bad asthmatic attack after the infusion. She also developed pneumonia and is now slowly recovering from that on a combination of antibiotics and inhalers. Unfortunately she still remains positive for Clostridium difficile and is on antibiotics for that also for 3 weeks more. It is likely that her immune system will take a while to recover after such large doses of chemotherapy and this is the reason for persistent and new infections. Grace takes all her meds without complaints but finds it a little easier if there is a reward to look forward to! Grace will be due the fourth course of antibody in the middle of June provided she has not developed HAMA . At the end of June also she will have all of her tests repeated including MRI, Cat Scans, MIBG scan and Bone marrows tests to see if she still has active cancer at any site. Grace has now completed her second cycle of 3F8 treatment and all of her radiotherapy. The 3F8 continues to be very painful but thankfully Grace has not developed immunity to the treatment as yet, by forming the HAMA antibodies. She will be rechecked for HAMA next Monday and if negative can proceed with the third cycle of 3F8 treatment. The radiotherapy was very intense, twice a day for 7-week days under general anaesthetic each time to three sites. Grace had lots of side effects mainly related to inflammation of her bowel, (called mucositis). The effect of this was that she could not eat or drink for a week due to severe mouth ulcers, throat pain and diarrhoea. However she has recovered dramatically well and is now making up for lost time and all the fasting! She remains infected with clostridium difficile however and this is proving very difficult to eradicate. Kevin and Millicent are overwhelmed with all the support from friends, family and colleagues. 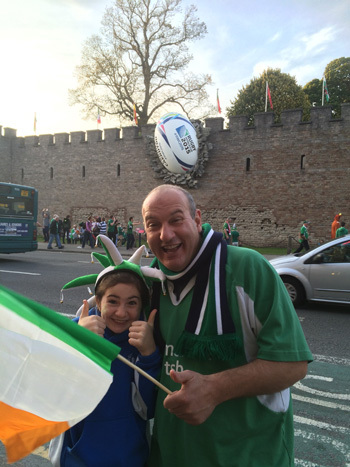 There have been many fundraising events in Ireland, England, New York and Canada. They are hoping that all this will help to raise the profile for neuroblastoma children in general as well as benefiting Grace of course. Next week Grace is having all of her tests repeated to ensure she is still responding to the treatment and has not relapsed since last assessed. This is the risk with neuroblastoma as unfortunately relapse is common for many children. However on a positive note, Grace is in great form, her hair is growing again and she is putting on weight and is not afraid to stand up for herself! Brendan O’Brien was a leading member of the well-known Dixie’s band from the 1960’s in Ireland. He sadly passed away in April 2008 and the O’Brien family requested that instead of flowers donations be sent to Grace’s Trust. Grace and her family would like to extend their deepest sympathies to the extended O’Brien family and thank them for their exceptional thoughtfulness at this sad time in their lives. Graces family would also like to sincerely thank all individuals who kindly made a donation to Grace’s medical fund in memory of Brendan O’Brien. Grace who lives in England celebrated her second birthday on April 6 and while her proud parents Kevin and Millicent certainly shed a tear on their daughter's birthday, there was also tears of worry. The cancer which she has is called Neuroblastoma and initially the prognosis showed a relatively low survival rate of approximately 20-25%. However, the development of a new treatment, called anti-GD2 antibody, could increase her chances of survival. This treatment is available at only one centre in the world, Memorial Sloan Kettering Cancer Centre, in New York which has an 80% survival possibility. 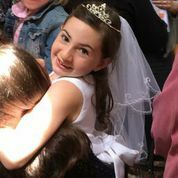 The 10 sixth class students in Cullen became aware of Grace's plight to raise $800,000 for this new treatment and the students were determined to help little Grace in some way. Principal Hannah Kelleher told The Corkman that the students raffled their own Easter eggs and raised €454.60 for the Grace O'Gorman fund. 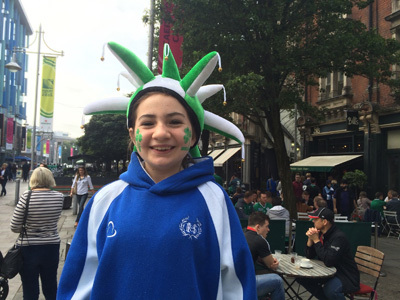 Ms Kelleher said the students organised the entire event themselves and it gave the students a great sense of pride to help little Grace. It simply made everyone's Easter and in particular for the students who worked so hard. We are very proud of the students as they learnt the true lesson of giving, said Ms Kelleher. Kathleen Mullane accepted the cheque from 6th class pupils which will go in some way to help Little Grace's parents pay for surgery, chemotherapy and radiotherapy. Grace was 2 today. She had a great time singing happy birthday all day. 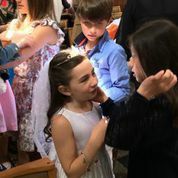 She went to The Rudolf Steiner Square dance (Alice’s school dance) and celebrated in style with the help of her big sister, Alice by dancing the afternoon away. Some very keen 2-year old boys hotly pursued her there! Millicent and Kevin were overjoyed, as there was a time not so long ago that they wondered whether they would have the opportunity to celebrate this special day with her. Their motto is to ‘ stay positive’, as it is the only way forward at a time like this and so far it is working. Grace’s repeat scans showed marked improvement in all of her cancer sites. This enabled Grace to start her 3F8 antibody treatment on 17th March 2008 and she had one dose each day for a week. Kevin joked that to start on St. Patrick’s Day must be a good omen, as St. Patrick had such great success at ridding Ireland of snakes that he must surely be able to rid Grace of the remaining cancer! Millicent and Kevin had been warned by Dr. Kushner and his team at MSK that the treatment caused severe pain. However, nothing could have prepared them for what lay ahead. Grace suffered unbearable and excruciating pain for the duration of the treatment. This was because the 3F8 stimulates nerve endings. Not even the highest dose of morphine took the edge off of the pain. As a physician, Millicent had never witnessed such raw pain and it was truly shocking. As a parent it is heartbreaking to witness this happening to your child and be totally helpless to comfort them. The hospital funded, through a research grant, a dance therapist to attend Grace to help her at this time. Aside from the pain and a hive like reaction Grace did well on the treatment and is due to have her second session of 3F8 on the 14th April provided she is not found to have developed immunity to 3F8 (i.e. an antibody called HAMA to the antibody treatment). She will be tested for HAMA this week. It is planned that Grace will have 3F8 treatments every 3 weeks until the Summer and then every 8 weeks for up to 2 years. In reality, it is likely that she will receive only 4-5 sessions of 3F8, if she is lucky, as most patients become immune to the antibody treatment after a few cycles. This is especially true for UK or European patients who attend MSK for 3F8 treatment as they have had a different induction chemotherapy regime that does not adequately prevent the development HAMA. This was the main reason that Grace was moved to the US earlier than most as it was strongly advised by the team at MSK that to avoid HAMA she needed to (i) commence 3F8 as soon as possible after surgery and to (ii) have 2 cycles of the MSK regime of high dose chemotherapy prior to 3F8. This could not have been achieved in the time frame available by her staying in the UK. Grace is commencing high intensity radiotherapy on the 1st of April. This will involve radiation to 3 sites twice a day under general anaesthetic spanning a two week period. This type of radiation is called hyper fractionation and is only done for Neuroblastoma at MSK. The family have been told that using this treatment the likelihood of recurrence of cancer at the primary site is less than 10%. The family eagerly await the results of the HAMA test and hope that Grace will be able to continue the 3F8 antibody treatment as planned on 14th April 2008. However, they are constantly reminded that Neuroblastoma is a disease that is characterized by relapses. It is hoped that the 3F8 treatment if she receives sufficient doses will reduce her risk of relapse and further increase Grace’s chance of survival to 80% at 5 years. 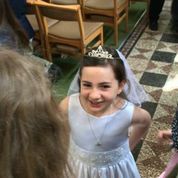 Since arriving to New York on 8th January 2008, Grace has had a busy time with hospital visits, admissions and procedures at Memorial Sloan Kettering Cancer Centre (MSKCC). However she is always in good form and never complains. She seems to love MSK and has been known to say to her parents that she is ‘ home ‘ when running in the front door of the hospital!! Grace had a series of tests the first week she arrived in the USA to assess the effect of 80 days of chemotherapy that was completed prior to her leaving Bristol Children’s Hospital and to prepare for the planned surgery. Grace subsequently had surgery on 21st January 2008, which was a long and tense day for the family. But she pulled through very well. Dr. La Quaglia, her surgeon, gave regular updates from theatre to Kevin and Millicent and met them in person later that day to tell them that all went very well with a complete resection of the primary lesion. Grace then had two courses of very high dose chemotherapy spaced 3 weeks apart. This was a very trying time as the first course was commenced just 4 days post operatively. Grace became very ill due to infections as result of severe bone marrow suppression following the first round of chemotherapy and was hospitalised for the best part of 3 weeks. The next round of chemotherapy went more smoothly with only a few short admissions to hospital. This week Grace is having all of her tests repeated including MRI, CAT scan Bone Marrow tests and MIBG scans. All these need to be done under General anaesthetic on separate days. However they are essential to see if the treatment to date has led to even a partial remission. The family eagerly await the results which are required before the next stage of treatment can commence or indeed be even planned for Grace.